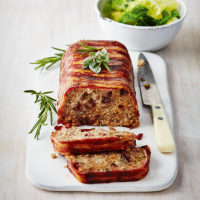 Give meatloaf a festive makeover with the addition of lots of lovely herbs and cranberries – this crowd-pleasing lunch or dinner is fantastic with all the trimmings. 1. Heat the oil in a small frying pan and gently cook the onion for 8-10 minutes until softened. Add the garlic, herbs and cranberries and cook for a further 2 minutes, then transfer to a large bowl. 2. Preheat the oven to 190ºC, gas mark 5. Line a 900g loaf tin with the bacon rashers allowing them to overhang the edges. 3. Beat together the egg and tomato paste and add to the bowl with the sausagemeat and breadcrumbs, then mix well together. Pack into the tin and fold the bacon over the top. Bake for 45 minutes until golden brown (cover loosely with foil if it browns too quickly) and cooked through. Rest in the tin for 5 minutes, then turn out and slice. Try serving with shredded green cabbage and Waitrose Onion Gravy.